In July this year I wrote about the, “straws in the wind” that China’s March/April trade figures might represent. I also introduced a new concept – the idea of a “normal” level of pigmeat imports by China. 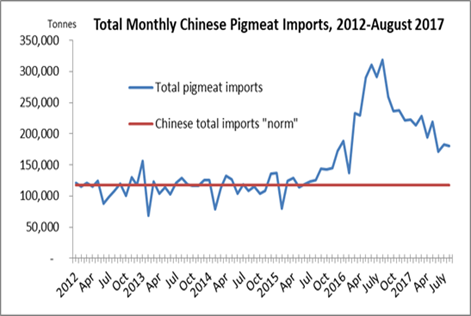 That “normal” monthly level reflects an annual norm of around 1.4 million tonnes of imported pigmeat into the Chinese market. 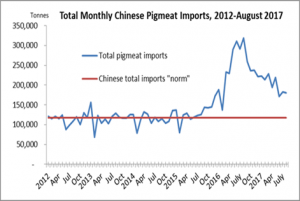 The monthly trade in imported pigmeat (pork+variety meats) into China now looks like it is in freefall. These imports have been showing a year on year decline in their volumes for the last six months. Total pigmeat imports by China were down 44% in August 2017 (they were down 2.1% in March, -15% in April,-24% in May, -45% in June, and -37% in July). My chart alongside says it all. In July I suggested that, rather than 2017 seeing more growth in China’s pigmeat imports, we would see a big decline. That prediction looks to be very accurate now – and it seems that the trade media and various commentators have been too enthusiastic about China’s demand for pork imports throughout 2017. Why does this matter? Well, the global market for pork received a boost from Chinese imports in 2015 and especially in 2016 and that affected pig prices everywhere – as the CEOs of major pork processing operations in the West were ready to admit in several annual reports and press statements in the last twelve months. 2017 looks set to produce a very different outcome for China’s import trade in pigmeat and the impact of global pig prices may already be showing itself. Watch this space – or check out the latest issue of Whole Hog Brief (#272) for a deeper discussion of developments in China and in global pig prices. Those CEOs may be singing a different tune as 2017 enters its last quarter…..